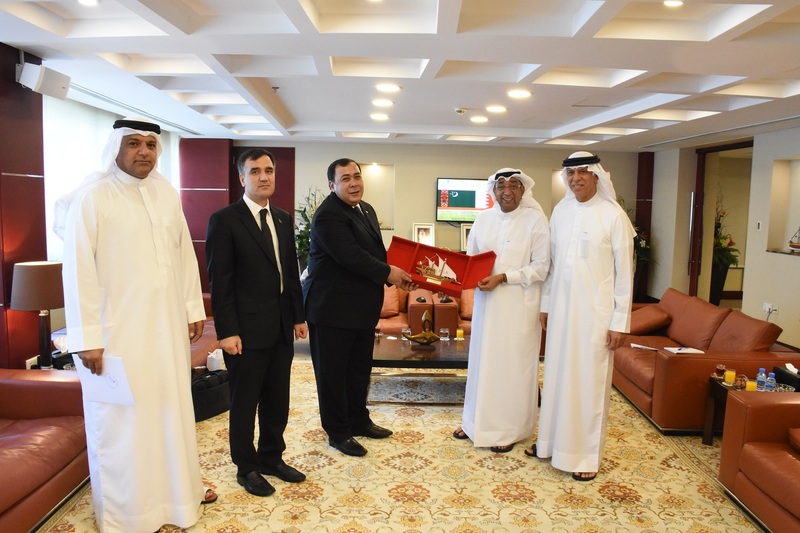 Chairman of the Bahrain Chamber of Commerce and Industry (BCCI) Mr. Sameer Nass received yesterday at Bait Al Tijjar the Turkmen Deputy Foreign Minister H.E Berdiniyaz Matiyev. The meeting discussed the current standing of trade between Bahrain and Turkmenistan, and underlined the prospect of taking business cooperation to further heights. The meeting shed a scope light on business and investment opportunities particularly in the oil and gas, petrochemicals, food, and apparel industry, and mulled exchanging business delegations and holding business events to stimulate liaison between members of both business communities and invigorate trade, and investments. Present at the meeting were also BCCI’s Treasurer and Acting Chief Executive Officer Mr. Aref Hejris, Second Vice-Chairman Mr. Mohammed Al Kooheji, and other officials from the Chamber.